A 70-year-old man was arrested in Spokane on Wednesday for making threats to the family of late-term abortion provider Warren Hern, subject of a recent Esquire profile. New protests by extreme anti-choice groups will take place in Nebraska this weekend. Operation Rescue, the group founded by Randall Terry, who said of the murder of late-term abortion provider Dr. George Tiller earlier this summer that he "reaped what he sowed" will be at Carhart's clinic today and tomorrow. 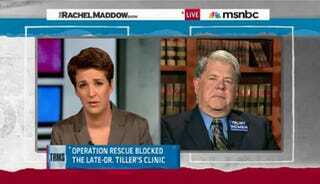 Carhart appeared on the Rachel Maddow Show last night to discuss the threats. He said he isn't canceling any appointments. The resurgence of threats against abortion doctors and clinics (and by extension the women who go to those clinics) is a sign of an increasingly frustrated group of extreme pro-lifers. At the time of Tiller's murder earlier this summer, Cara at Feministe wrote, "This is the first time an abortion provider has been murdered in over a decade. I have friends who work in abortion clinics. This is terrorism." The reluctance of the government to call the threats against law-abiding citizens and doctors is disturbing. Donald Hertz, the man in Spokane accused of making threats against Hern across state lines, faces up to six years in prison and a $350,000 if he's convicted. That certainly isn't an insignificant threat of punishment, but it certainly isn't on the level of what others accused of terrorism face. What's more, after Hertz posted bail on Wednesday, he was released. Meanwhile, an ad in a Chinese newspaper offers "students who come to get an abortion can get 50% off if they show their student ids," something that rubbed some readers the wrong way. But other readers pointed out that in America the debate has become so framed by anti-abortion protesters that women are "expected to treat abortions as necessary tragedies." Abortion is legal and widely accessible in China, costing about 600 yuan, or $88. A wave of anti-abortion violence in the 1990s-three doctors killed in five years-coincided with a dramatic drop in providers, from 2,680 in 1985 to 1,787 in 2005. Carhart worries that if he and other doctors retreat, Tiller will have the same legacy.